ICIWaRM, in collaboration with Deltares (The Netherlands), developed and conducted led hands-on training on Collaborative Modeling for Decision Support in Integrated Water Resources Management (IWRM) in Accra, Ghana on April 11-12, 2017. The training was in association with a Global Water Partnership (GWP) Technical Committee (TEC) meeting. 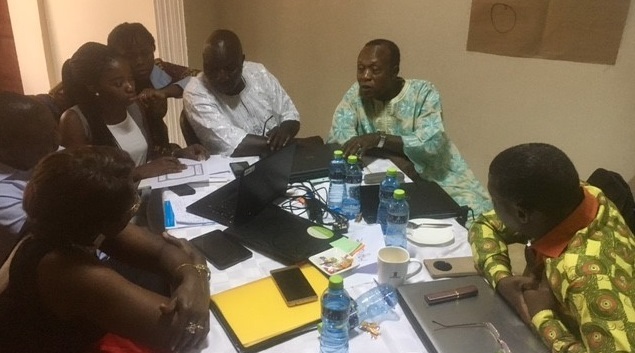 The Ghana Water Resources Commission and the Ghana Country Water Partnership of Global Water Partnership hosted the workshop, which brought local water practitioners from West Africa together with TEC members. The training led participants through the four key pillars of collaborative modelling, using a local case of Ghana’s Densu Basin Integrated Water Resources Plan on water availability and water security. Participants included a mix of 30 local water experts and practitioners from Ghana and neighboring West African countries, as well as 8 international members of the GWP’s Tech team, led by Dr. Jerry Delli Priscoli. The lead trainers were Drs. Guillermo Mendoza and Seth Cohen of IWR/ICIWaRM, and Laura Basco Carrera of Deltares. The course showcased how collaborative modelling can support key decision-making for managing flood risk, building infrastructure, managing groundwater, and bringing together the social, economic, and environmental issues and challenges of integrated water resources management (IWRM). More importantly, the training demonstrated the value of bringing stakeholders and technical experts together in a formal procedure early in the planning process, and working in various stages of participation throughout the modelling effort to build consensus, trust, and improve decision-making. Illustrative case study examples of collaborative modeling in the U.S. Great Lakes region, Peru, and Bangladesh were presented and stakeholder roles and responsibilities within the collaborative modelling “Circles of Influence” were explored. Participants began the process of thinking about what a locally preferred plan and alternatives, using a model of the Densu Basin, might entail and analyzed potential conflicts and challenges to implementing collaborative modelling in the region. A more detailed write-up, and a video, of the training course and related events may be found at GWP.